1. Preheat the oven to 180°C, gas mark 4. Roll out the pastry to 5mm thickness and use to line 4 individual 12cm-wide x 2cm-deep loose-bottomed tart tins. Fill the tart cases with baking parchment and baking beans and bake blind for 10 minutes. Remove the parchment and beans. 2. Meanwhile, in a small pan, heat the double cream very gently until it just reaches boiling point then remove from the heat. Place 1 whole egg and 2 egg yolks (reserving the 2 egg whites for the topping in step 4) in a bowl and beat gently with 50g of the sugar. Pour over the hot cream, whisking all the time, then add the coconut cream and stir to combine. 4. Using a handheld whisk, beat the reserved egg whites to soft peaks then slowly add the remaining sugar, a little at a time, until you have a glossy, stiff meringue mixture. 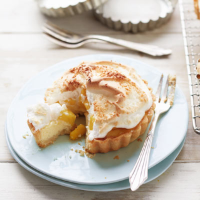 Spoon the meringue on top of the mango and sprinkle with the desiccated coconut. Bake for 4-5 minutes until golden. Leave to cool in the tins for 10 minutes then carefully remove and serve.